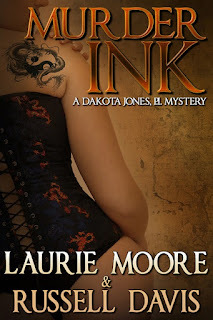 Murder Ink, the new thriller from Laurie Moore and Russell Davis, is now available at Amazon, Barnes & Noble, and other retail outlets. Library Journal said, "... a refreshingly different take on the police procedural... The plot is handled deftly and Dakota is a compelling protagonist..." We also made the Washington Blade's FALL ARTS 2016 "Looking for a Good Book" column! Today, we're asking for your help to get the word out to as many people as possible. Please post links to your Facebook and Twitter feeds, as well as any other social media platforms you belong to, and help us get Dakota Jones, P.I. off to a great start!